One of Swindon's most recognised buildings remains in a dilapidated state despite efforts, over the years, to restore it to its former glory. At the beginning of July, Swindon Borough Council went to court and obtained a warrant to gain access to the building. On Thursday they were handed keys, supplied by the owner and eventually entered the site on Friday 9 July, without ever executing the warrant. Work on the building is now due to start later this month. 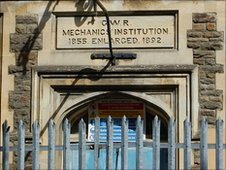 But how did Swindon's Mechanics' Institute get to this state? We look at the history of the building from its opening in 1854, to today. Swindon Borough Council try to gain access to the building, on Monday 5 July, to make it watertight and complete other urgent works but find the site padlocked and inaccessible. In a statement they say they will now apply to the court for a warrant so they can access the building. Owner Mr Matthew Singh is unavailable for comment. Mr Singh agrees to the list of repairs required by the Council just before the April, 2010 deadline. After examining Mr Singh's plans, the council decide that they do not give them, or the Health and Safety Executive, reassurance that the work will be done to the required standard. The council decides to do the work itself and recover costs from the owner at a later date. In December, Swindon Borough Council serve owner Matthew Singh with an Urgent Works Notice, requiring him to carry out work that will stop the building falling into further disrepair. Mr Singh is asked by the council to agree to carry out urgent works by April 2010 and to produce a suitable schedule, along with evidence that he has appointed an approved contractor to do them. The notice follows a survey, carried out by the council, to establish what works are necessary. 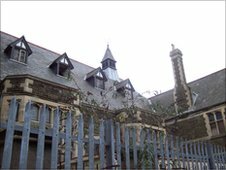 The building is placed on a list of the 10 most at-risk Victorian and Edwardian buildings by The Victorian Society. The list is compiled after the Society asks the public to nominate the buildings they most value. In May, a second planning application is submitted to the council to put in a hotel, flats and a business centre which would result in part of the building being demolished. Planning permission is granted for apartments to be put into the south end of the building. Work starts and the rooms begin to take shape but the work is not completed. By 2003 the building is sold to an anonymous developer for £500,000. He is later revealed as businessman Matthew Singh. Mr Singh carries out repair work to the building to make it more secure. He also improves the roof at the south end of the building. In 2004 he submits plans to turn the building into a hotel. The work requires part of the building being demolished. The government steps in, after intervention from the Mechanics' Institute Trust, but planning permission is not granted. The government begins the process of a public inquiry but two days before it is due to get underway, the planning application is withdrawn. 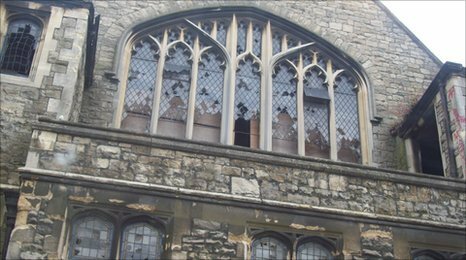 English Heritage say the building requires urgent work carried out on it to prevent its condition from deteriorating further. An Urgent Works Notice is prepared but the owner decides to sell up and the notice is not issued. The Mechanics' Institution Trust is formed and 1,400 members agree that the building should be restored. The newly created Trust draws up plans for the building. In 1999 the Trust send a report to English Heritage, who subsequently upgrade the building from Grade II listed, to Grade II* listed. 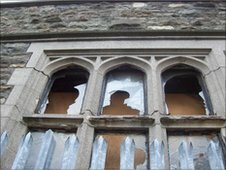 The new listing means it is of sufficient importance to warrant inclusion on the English Heritage Buildings at Risk Register. British Rail offer to sell the building to the council but it is eventually sold to a third party. The new owner draws up plans to turn the north end of the building into a nightclub in 1987 but the plans are not welcomed by local residents, who form the Mechanics' Institution Action Group. The nightclub project is eventually abandoned. In 1988 the building is sold again and the new owners propose converting it into a hotel. Plans are submitted, and after initially being refused, are granted following a public inquiry in 1990. However, the hotel does not materialise and the building starts to show signs of wear and tear. The council pay for a fence to be put up around the building. In the early 1990s the building is transferred to new owners but still no hotel is built and in 1995 the planning permission expires. The building closes on 9 February 1986 and owners British Rail set about trying to find a buyer. This is the era that British Rail is nationalised and sees the Mechanics Institution merge with the British Rail Staff Association. It means that the Institution is effectively no longer owned by its members. The library closes and moves to temporary buildings in the town centre. There is a fire in the building which causes significant damage to the stage area of the theatre. The building is repaired, despite it being the depression, with the addition of the 'fly tower', which is still visible today. The Mechanics Institute opens in 1854 (official opening is in 1855) at a time when the railways are booming. 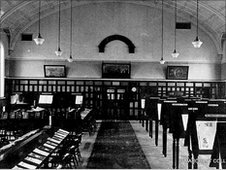 The building is used mainly by railway workers for classes, lectures and reading, and houses a library. There is a market on site for railway workers and their families to buy food to save them having to walk over rough land to the shops in Old Town. The building goes on to house a theatre. Historic railway building's future revealed?